Everyone loves pumpkin this time of year! We love pumpkin so much we named our cat Pumpkin!! 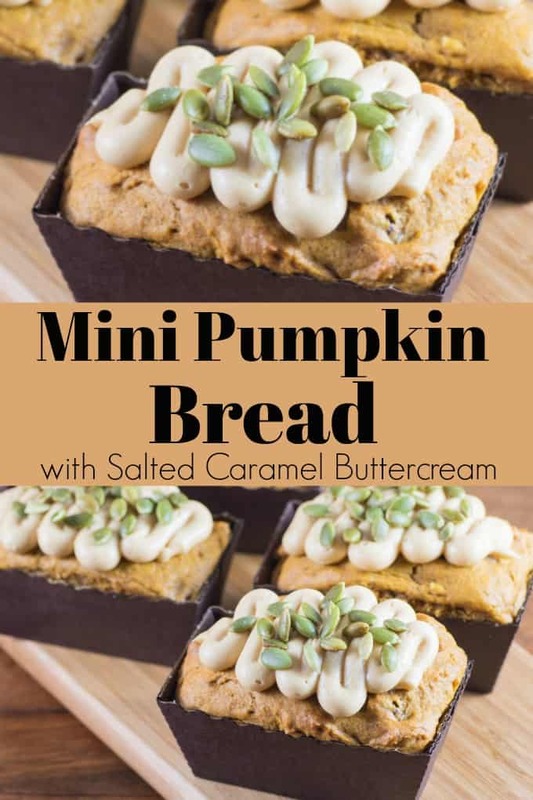 So I am excited today to show you this Mini Pumpkin Bread Recipe with Salted Caramel Buttercream! These are easy to make and have all the wonderful fall spice that everyone enjoys so much. Adding in pumpkin makes them super moist. We have made a Bread Machine Pumpkin Pie Spice Loaf that is super easy of course done in a bread machine and that was one that everyone loved. I think I made it at least three times last year. 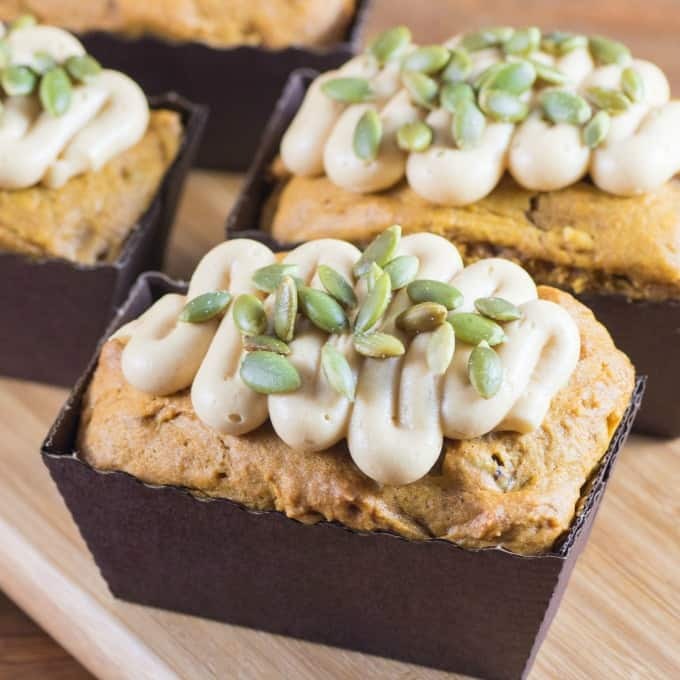 Topping these mini loaves off with a Salted Caramel Buttercream and pumpkin seeds make these a huge hit!! I found these little cardboard loaf pans at a bakery in Edmonton but they are easily accessible at any craft store too. Or maybe you have a mini loaf pan to use!? Mine were 4×2 inches. The perfect size for these little loaves. 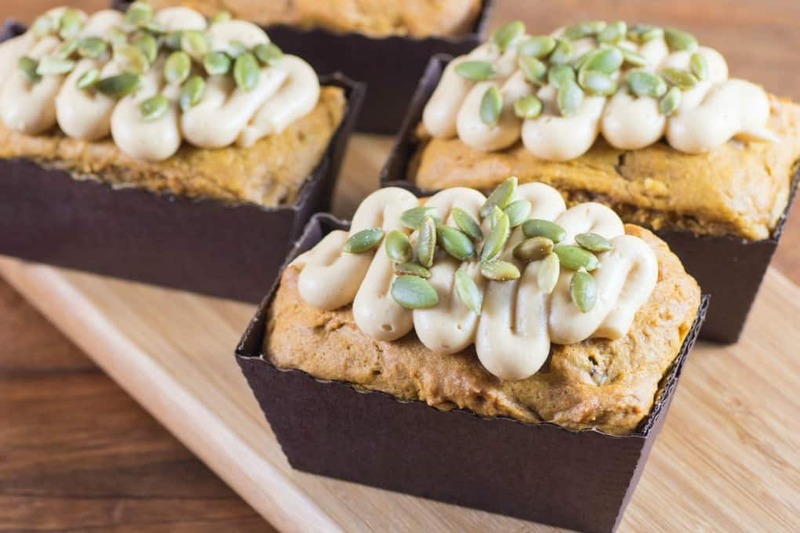 Some people ask can you make muffins with a pumpkin bread recipe? The answer is you sure can!! I had a little bit leftover from this recipe and I made two delicious pumpkin muffins also! 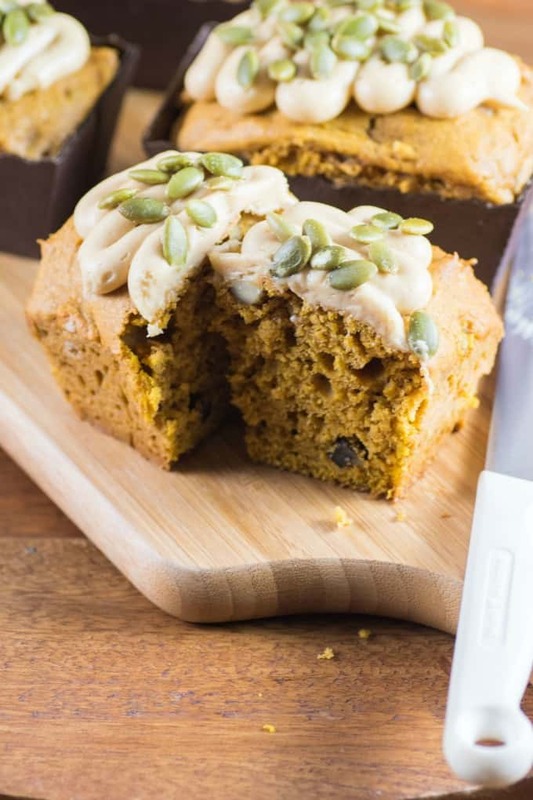 This is the best pumpkin bread recipe and very easy to make. Do you know how to check to see if the bread is baked through? There are a couple of tips I use after years of baking. One is that the middle springs back with a light touch. The second is that when a cake tester (or toothpick) is inserted into the center it comes out clean. Plus just the appearance and lack of jiggle of the bread and that it is starting to brown up nicely. Using those three tips will ensure you have a completely baked cake. You need to use all your senses with cooking and baking. 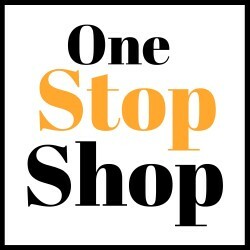 One very important one I think people forget is tasting as you go through a recipe. You will want to avoid raw eggs, raw meats or other things that can be harmful but to taste your buttercream as an example to make sure it has enough flavor is very important. I have tried using sugar pumpkins for baking and making it into a nice pumpkin puree but it is time consuming and you may find it less than satisfying in the end too. The canned pumpkin is the best I find to use for all my fall baking. Don’t mistake canned pumpkin pie filling for just plain pumpkin, there is a bunch of things added to that. You just want to purchase the canned pumpkin with no other ingredients added to it. I love adding in nuts to baking. In my opinion they add so much more to a recipe in both flavor and texture. I love getting a nut when I take a bite, that crunchy goodness goes a long way. Adding the pumpkin seeds on top is not only attractive but also another texture element and flavor too. Make sure to get lightly salted pumpkin seeds if possible and they will go perfectly with the salted caramel buttercream. To make the icing I didn’t want it to be difficult so I used a dulce de leche that I bought at the store. Here is the recipe for the Salted Caramel Buttercream frosting. This frosting would be great with so many cakes, cupcakes, cookies, loaves and more!! After you take them out of the oven make sure they cool completely on a wire rack before icing, otherwise you will have a melted mess of your buttercream. Even really warm hands while piping can melt your buttercream so try to chill your hands beforehand before starting. For a harder icing than this one warm hands are sometimes a good thing. I remember taking an icing class and my icing would just flow gorgeously to decorating. The poor lady across from me had the worst time as her hands were always cold and her icing was thick and so hard to work with. Just remember that tip if you need to keep your hands chilled though. Amber my daughter did the icing on these mini breads, she is so good at that I leave her to help me out. 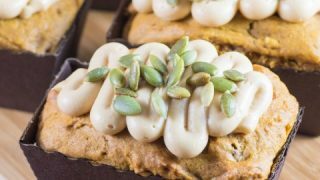 Mini Pumpkin Bread Recipe with Salted Caramel Buttercream is the perfect fall treat for any pumpkin lover!! Preheat oven to 325F. Lightly spray the inside of 12 4x2" mini loaf pans, (I also had enough for 2 muffins). Place on a sided baking sheet. In a medium bowl, mix together the flour, baking powder, baking soda, salt, cinnamon, cloves and nutmeg. In the bowl of a standup mixer beat the butter until creamy. Slowly add in the sugar and beat well. Add in eggs one at a time and beat until just combined. On low speed add in the flour mixture alternatively with the pumpkin. Stir in vanilla. Divide batter among loaf pans and fill 2/3 to 3/4 full. Bake for 45 min. or until cake tester or toothpick comes out clean. Remove from baking sheet to a cooking rack. Ice when completely cooled and decorate with pumpkin seeds. WOW! That was the first word I came up with in describing these. They look so tasty! I like the buttercream frosting for a great touch. Now this is an awesome use of that homemade caramel buttercream. These look adorable and they must be very tasty! Well look a that beauty! This is what I need in my life, every day during the fall and winter! I’m making this recipe this weekend when I have friends coming over! These are so cute looking! I love pumpkin bread so much! I love the addition of the fresh seeds. I’ve had pumpkin bread before but you really sold me with the buttercream frosting. That is the perfect touch it has been missing! This recipe looks amazing! I love just about anything pumpkin. I bet these taste great too. Fun, I love small loaf breads. Especially pumpkin foods! Wow – definitely a sweet and decadent treat for this season. I love all the fall sweets! I need to make these. I have all these mini bread pans and no idea what to do with them. These are like a work of art! My first thought was WOW, but I had seen that another commentor said that lol. I love that they would be perfect for gifts or just to serve at a family gathering. Wow, what an awesome looking recipe! It’s almost too pretty to eat. I so want to try this very soon. 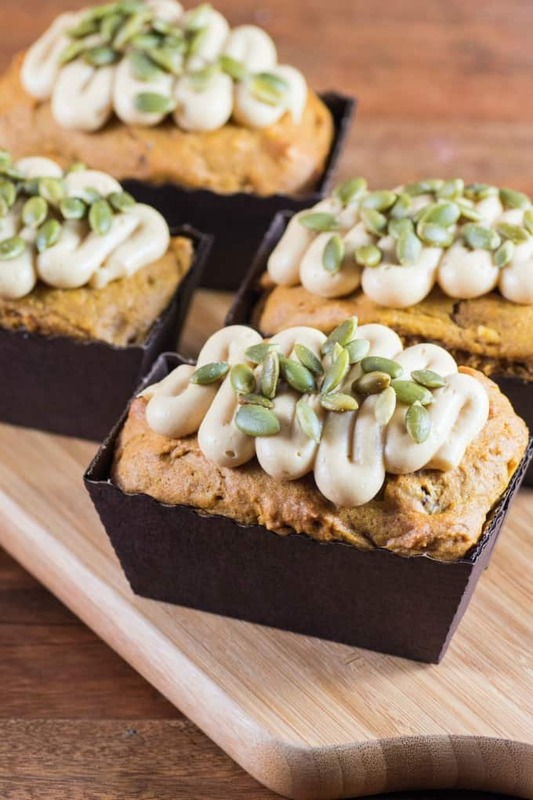 The texture of these mini pumpkin breads are so perfect! I love these autumn flavor combo! What an amazing recipe Tara! I can’t wait to try it! 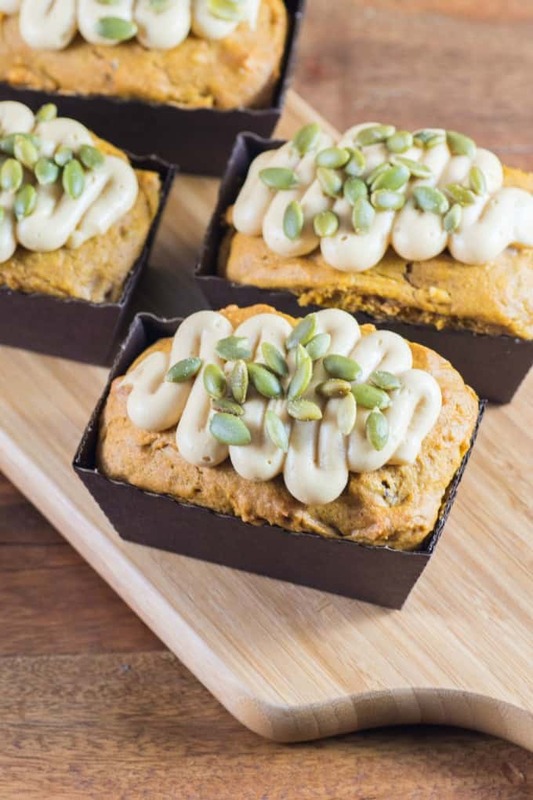 Pumpkin bread is such a delicious treat, and I Love these adorable mini pumpkin bread loaves. They are simply adorable and would make an excellent family or friend gift, even for coworkers to those who work in an office space. Going to try to make these.